It’s not enough to know how to manage common work-life challenges; you must also deal with the uncommon ones. 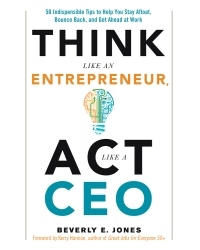 Think Like an Entrepreneur, Act Like a CEO gives you proven, easy, go-to techniques for handling even the biggest career surprises, one step at a time. Since 2002, Jones has built a respected executive coaching and consulting practice, leading retreats and mentoring professionals of all ages to advance their careers, shift directions, or boost their productivity. Based in the nation’s capital, she works with accomplished leaders in Congress, at major federal agencies, NGOs, universities, and large corporations. She is a popular blogger, and her podcasts are distributed through public media.